What if you want to protect a folder on a removable drive such as a USB flash drive or other external drive? 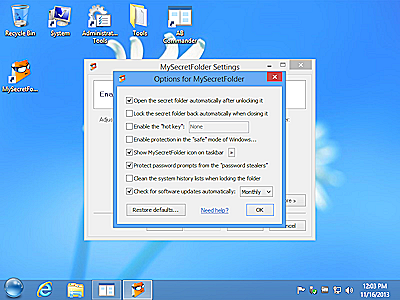 In such a situation, MySecretFolder would not be a good choice, because the folder would be protected only while the removable drive is attached to your computer. To make sure the drive is protected on any computer, consider using another product of ours: USBCrypt. USBCrypt is specifically designed to protect the removable drives with strong encryption, take a look at it. 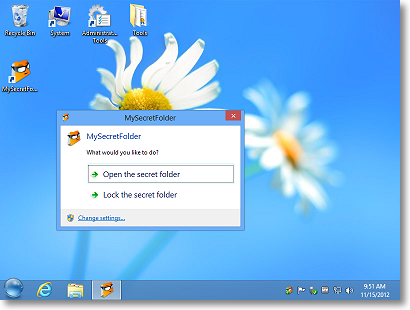 After selecting the folder to be secret, you can press the Open the folder button to open the folder in a window (while it's still unprotected) and copy or move the files you want to be secret into it. You can create subfolders inside of that folder, too, to better organize your private files, if you have a lot of them. 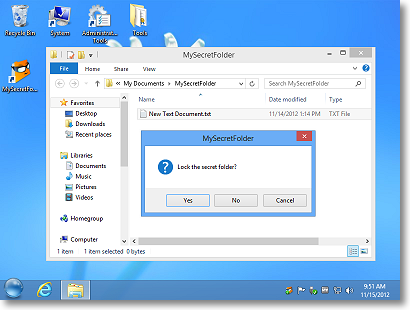 The secret folder can have an unlimited unlimited number of files and subfolders, all of them will be protected just as well as the secret folder itself. You can also move and copy files in and out of the secret folder later on, too. You can double-click the MySecretFolder notification icon to display this prompt. 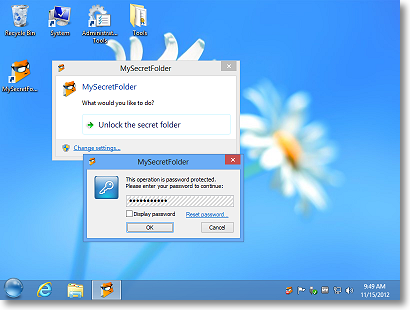 Or, you can run Windows Explorer, navigate to the parent folder of the secret folder, and right-click on the secret folder to access the Lock command. No matter which method you choose, when you lock the folder, it becomes invisible and protected again, until you unlock it with the password next time. I am using my secret folder app. 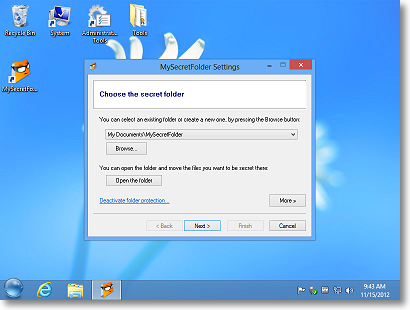 Antony: MySecretFolder can protect only one folder at any given time. If you want to protect more than one folder, please consider another product of ours, Folder Guard. 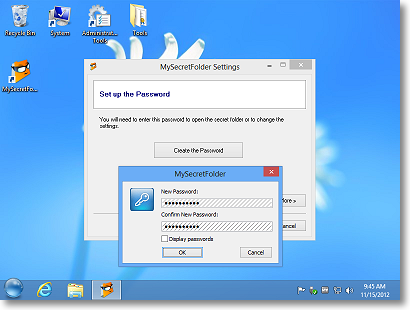 It can protect an unlimited number of folders, but it is not as easy to set up as MySecretFolder. If you have other questions in this regard, please contact us using the Contact Us link under the Help menu in the upper-right corner of this web page. Good luck!